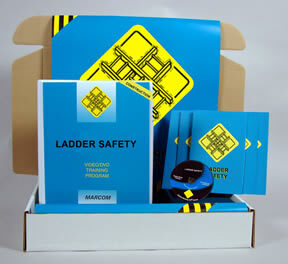 Ladder Safety in Construction Environments Construction Safety Kit shows that because they are so common, many employees take ladders for granted, and don't take the appropriate precautions when using ladders. Ladders are one of the most commonly used pieces of equipment in almost any work environment. From common stepladders to sophisticated extension ladders, they can be found almost everywhere. Materials in the kit include a DVD program, five motivational posters, and 30 employee booklets. The posters in the kit emphasize the importance of ladder safety. The DVD program and employee booklets include information on ladder selection, inspection and maintenance, proper set-up, overhead hazards, climbing and working safely, accidents and first aid, and more. The DVD program in the kit comes with a comprehensive leader's guide, reproducible scheduling & attendance form, employee quiz, training certificate and training log.